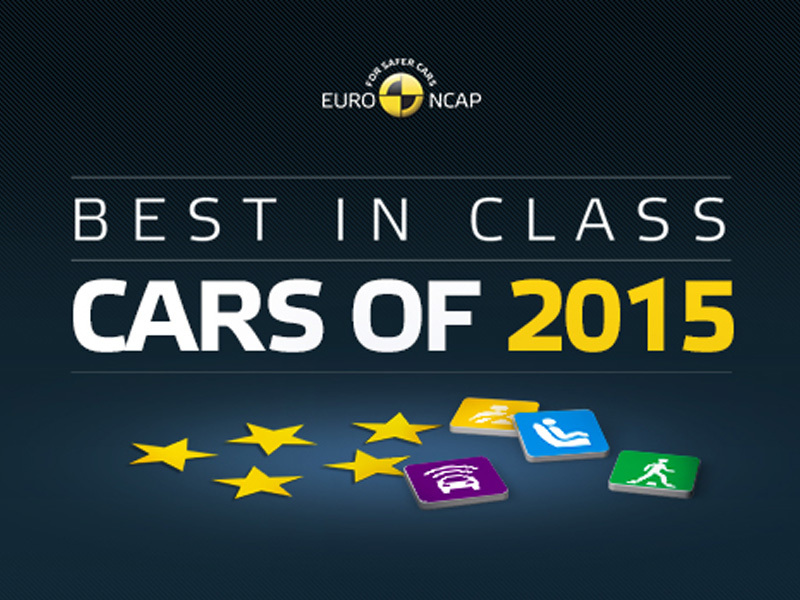 Brussels, 13 January 2016 - Euro NCAP reveals today the Best in Class cars of 2015 out of over 40 vehicles released during a very busy year. The best performing large off-roader, and the car with the best overall performance of 2015, was Volvo's XC90. The Swedish company's new flagship achieved an outstanding 97 percent for adult occupant protection and a maximum 100 percent for its safety assist technologies. The Mercedes-Benz GLC is the best small off-roader of 2015. In the large family category, two cars performed equally well: the Jaguar XE and the Toyota Avensis gave identical overall results. The Jaguar takes top honours in this category as all of its safety equipment is standard. The Toyota has some driver assistance technologies as an option, however comes at a generally lower price. The best performing small family car was the Infiniti Q30, with strong performance in all areas of assessment. In 2015, two superminis gave the same overall safety performance. The Honda Jazz and the Suzuki Vitara were neck and neck overall, one car edging the other in one or other part of the assessment. However, the Jazz is Euro NCAP's Best in Class, based on Honda's fitment strategy for advanced safety systems. The VW Touran was the best performing small MPV; The Ford Galaxy/S-MAX just beat the Renault Espace for top place in the large MPV category. Finally, last year Euro NCAP has paid special attention to the roadsters, a category of relatively expensive cars but for which the importance of safety is often downplayed by vehicle manufacturers. None of the tested roadsters could achieve 5 stars, lacking new avoidance technology in particular. Nevertheless, with 4 stars, the Mazda MX-5 is the best in its category. Cars from Germany, Sweden, Japan and the UK are amongst the class leaders of 2015. 2016 brings new challenges as Euro NCAP introduces an assessment of AEB Pedestrian systems. Some cars, mostly in the premium sectors, already have this technology and should be well placed to lead the ever-improving safety of tomorrow's car fleet. Detailed results and crash test pictures of all best in class cars are published on our website. Videos are available on our YouTube channel and Media Center for journalists. For media requests, please contact Marie Brasseur, media@euroncap.com.